You may remember, (if you are goofy enough to actually follow this blog) that Walmart hates my car. So, I figure the time has come to declare war. It will be the great War on Walmart by Mickey. And I am pretty sure they won’t even feel it. You see, I went to their manager with a complaint about them trying to make my car fart itself to death with too much oil after they originally screwed up the oil change. I mean, everything was entirely their fault. They forgot to replace the cap on the engine when they first changed the oil. They also forgot to drain the old oil out completely when they cleaned up their mistake and put in replacement oil (which they did for free and that apparently counts for more than I think it did). They did remember, however, to hold on to the receipt so I would have no proof in court that they had even done this particular oil change. And they were not going to reimburse me for the $140 I spent at the Ford garage to make sure their mistakes had not caused permanent expensive damage to my car. They informed me that on the receipt I had signed my name to the fact that I brought the car in low on oil and that they were not responsible for any damage to my car that may have caused. And besides, I couldn’t prove that they had done any damage to my car because the Ford dealer’s diagnostic results only proved that the car was NOT damaged. So, they basically screwed me out of $140 dollars plus the original $30 for an oil change that had to be completely redone. So, step one, never ever ever… and I mean completely never ever… get any automotive supplies or work done at Walmart ever again… never again! The hated Walmart on Frankford and Marsh… scene of much of Mickey’s misery. Step two, find other ways to deprive Walmart of every Mickey dollar I possibly can of the huge chunk of my salary they soak up every month. It is hard to make the money last as long shopping anywhere else, and Walmart has driven almost all of their competitors out of the area. You can, for the most part, only buy the same things for more money at other area stores. You are stuck shopping at Walmart because for the average American that is all you can afford. But I found a place that actually sells groceries cheaper. 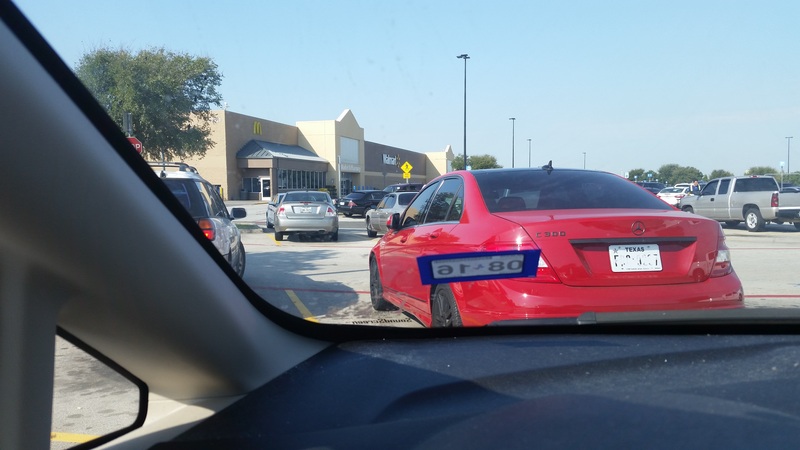 I followed all my Hispanic neighbors to Aldi’s. Yes, Aldi’s has taken over for the Kroger’s and the Albertson’s in the hearts and minds of the local people. (Walmart wiped out Kroger’s on Old Denton Avenue, and forced Albertson’s to raise their prices to stay open). Aldi’s, however, saves money in every way imaginable in their little mom-and-pop-type stores. My grocery cart at Aldi’s. 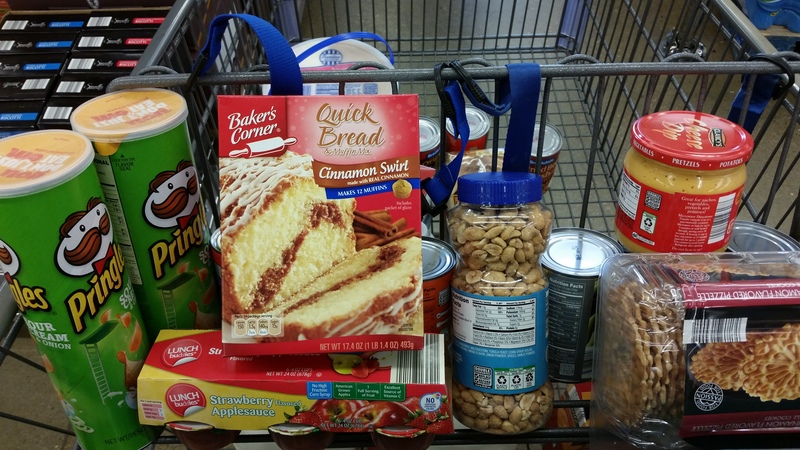 My cart at Aldi’s in the Paffooney above ended up costing me $41.32. Now, I know for people as dinosaur-ancient as me this is a horrible price to pay for what once cost under $10, but it compares really well with the estimated $65 the same cart-full would’ve costs at the Walton family’s evil everything emporium. And you can’t really see it in this view, but I have a good sized tub of Neopolitan ice cream in here that I bought for less than $4. And there is a 24-bottle raft of drinking water in the cart for only $1.29. (And yes, I also remember when you got water for free and the tap at home didn’t have only hot-and-cold running Texas frog-water in it… with all those delicious fracking fluids added in for flavor, but water now can only be safely had from Nestle bottle trees). So, I can rebel against Walmart by not buying everything from them, and I still get to eat and feed my family. I even save a few dollars. And the best thing is… cookies! 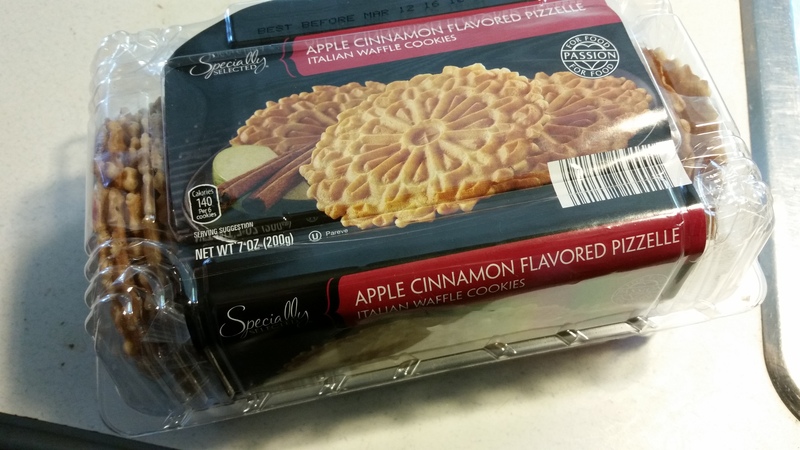 You probably didn’t spot these in my cart, but these are delicious Italian apple-cinnamon cookies for less than $2!! !